One of the most beloved Far Cry games is Far Cry Blood Dragon, a spin-off released in 2013. This standalone expansion to Far Cry 3 took place in a retro-futuristic world and parodied 80s action movies and video games. Now, in Far Cry New Dawn, you can kind of relive your experience from Blood Dragon. Ubisoft has included the Rex “Power” Colt Outfit from Blood Dragon in New Dawn. Let’s go over how to unlock it. First, you’ll want to head over to the Watering Hole Outpost, which can be scavenged. By scavenging it, you’ll acquire Ethanol, and the Outpost can be repeated multiple times. It’s best to play on the highest difficulty, because doing so will increase your chances of getting a piece of the Blood Dragon Outfit. Rinse and repeat the Watering Hole Outpost to eventually unlock all the pieces to the Blood Dragon Outfit. For those who just can’t bear the thought of repeating this outpost, you can purchase the outfit using the game’s premium currency. It will cost around $8. Those are the two ways to unlock the Blood Dragon Outfit in Far Cry New Dawn. 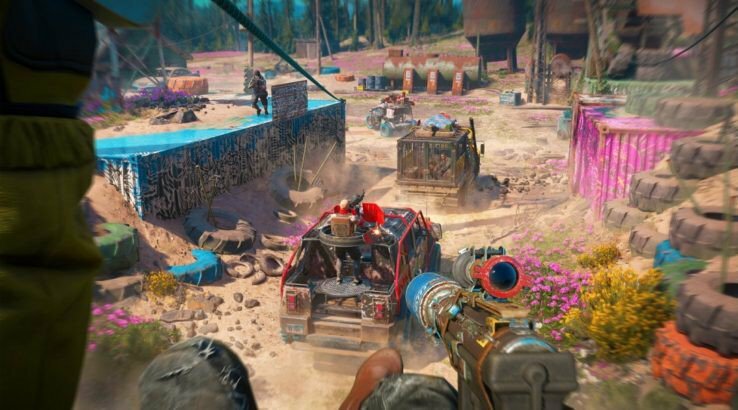 While you’re here, check out our review of Far Cry New Dawn. We enjoyed it! Will you be picking up New Dawn when it releases February 15th? Let us know!